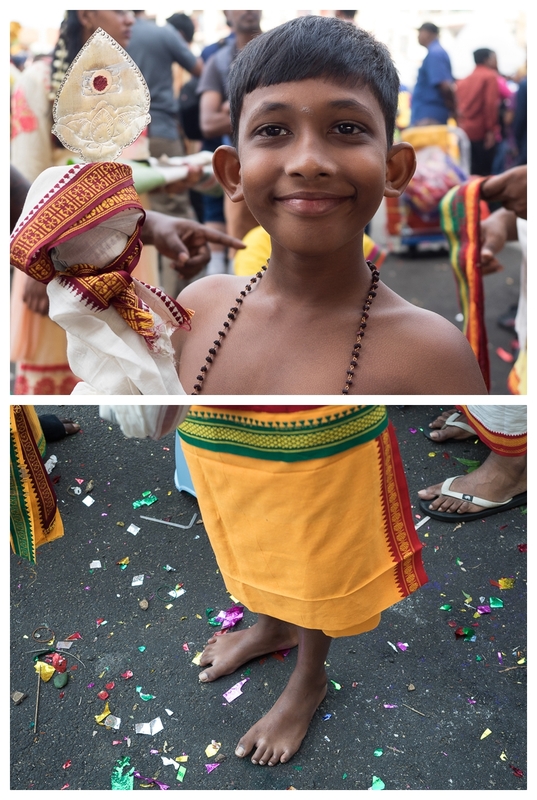 The annual Thaipusam festival was held on the 21st of January this year. A public holiday here Kuala Lumpur, once again thousands of pilgrims and observers thronged Batu Caves, one of the holy sites for Hindus in Malaysia. I’ve been to the Thaipusam festival a couple of times before and its always a huge event that attacks all your senses. 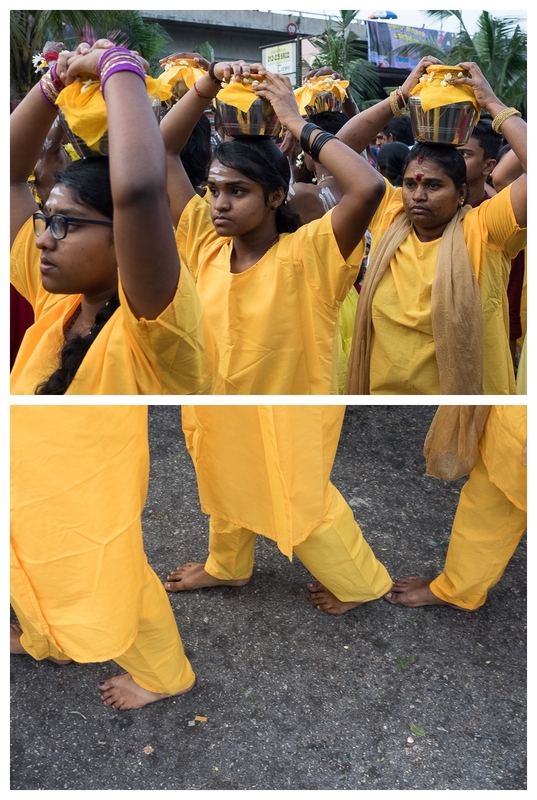 It is loud and hot, the fragrance from all the incense being burnt will definitely hit your nose, the outfits worn by the pilgrims were simple yet bright and colourful. And to test your taste buds, there’s always a large variety of food being sold by street-side stalls that pop-up for the duration of the festival. I decided to try and get into the Batu Caves are at the break of dawn, but due to the trains only running every hour from KL Sentral, I missed the sunrise. A shame that I missed that early morning light, as I’ve taken a few good shots at that hour before at previous years. This year instead of taking straight up single photos, I mentally forced myself to visualise my photos in the form of diptychs i.e. two photos to tell one story, or a photo in two parts. It wasn’t easy, as there was a lot going on around, so many different angles and different movements everywhere on the street. I decided pairing a portrait or upper torso with their lower half was the easiest. I got a few of those and a few others that “pair” with each other in my opinion. Also, as part of my very own photographic learning curve and in hindsight, I should have been documenting the festival in portrait orientation. That would have been the ideal way to showcase photos in the diptych format. As you will see below, photos in the landscape orientation don't quite work out so well being presented as diptychs. I didn’t get as many sets as I thought I would. Also probably not my best work. Oh well, you live you learn. 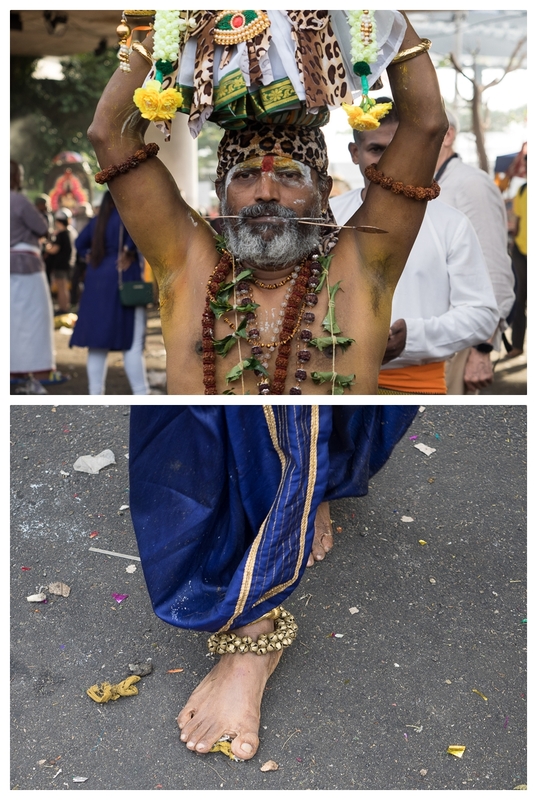 So, if you're ever in Malaysia at the start of the calendar year and want to witness a truly unique cultural and religious festival, why not time it with the Thaipusam festival. It'll definitely be worth your visit. Hope you like the format in which I documented this festival. All photos were taken with the Olympus OM-D E-M1 and the M.ZUIKO DIGITAL ED 12–40mm 1:2.8 PRO lens.